The Scottish missionary, Dr. David Livingstone, has been researching African tribes and the flor and fauna of the area. As part of the Livingstone expedition, strategically set up tents in various regions while collecting gems found along the Zambezi River bank. Gain the most victory points and the favor of Queen Victoria to win! I've enjoyed many children games by Play Room Entertainment and was equally satisfied with this "adult" game. 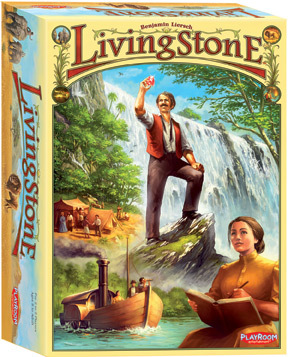 Livingstone is an easy play game. There are six "days" to the game. On each day and persons turn, you can draw a card, purchase tents, receive gold or search the mine. I personally like searching the mine because the bag of gems are awesome! You score two different ways. One, at the end of each "day" and then again at the end of the game,,. what a great concept! On top of that, there is a seperate issue going on. At any time you can pay gold to the treasure box. In order to win the game, you not only have to have the most points, but you can not be the person with the lowest amount of gold in the treasure box. So, do you put your gold in tents? Or pay it to the treasure box? Strategy is at work here! This is a great game! A very nice light Eurogame, which gives players several constant decisions about strategies for victory point conversion (and little treasure chests).